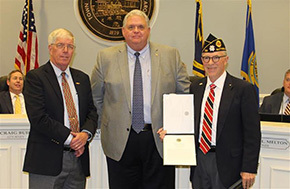 The Town of Matthews, NC recognized Michael Rusho (D-3) as the town’s 2018 Veteran of the Year during the Board of Commissioners meeting. Mayor Paul Bailey awarded Rusho the Mayor’s Medal for his selfless dedication to the betterment of his community. Mike has been involved in various community service organizations including the Boy Scouts of America, American Legion Post 235 (an active member for 24 years), and the Matthews Rotary Club. Of particular note is his ongoing leadership role in the annual Rotary Veterans Day luncheon, celebrating the service of all military veterans in Matthews.